I neither watch TV nor I read newspapers. So the only way I get to know about latest packaged food launches is through food bloggers who write sponsored/promotional posts. 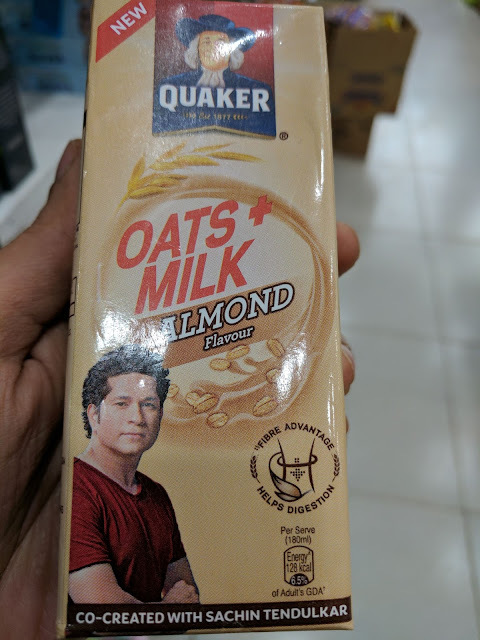 One such product that is being promoted aggressively is “Quaker Oats + Milk”. And the caption that caught my attention is “Co-created with Sachin Tendulkar”. Before we proceed, let me admit that I used to be a huge, huge fan of Sachin when he was playing active cricket. After retirement, I was hoping that he would teach his batting skills to talented youngsters, become a mentor / coach or something. It is a shame that he decided to co-create “junk foods”. Let me first list down the facts about this drink. 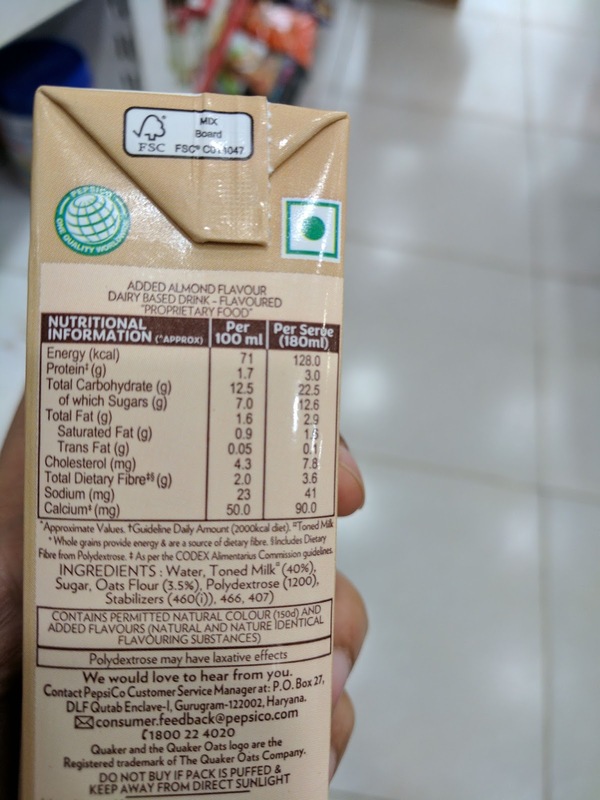 It is a milk-based drink, made with oats (India’s one-of-a-kind grain-dairy beverage). It comes in two flavours - almond and mango. The product’s promise is that it has fiber advantage and helps in digestion. I looked at the ingredients list of the almond flavoured milk. Guess what! There is no almonds listed anywhere. Are the almonds hiding inside “added flavours”? “Oats” is promoted as the primary ingredient in their messaging and packaging. But the percentage of oats flour is only 3.5% and listed after “sugar” (which means, the quantity of sugar is more than oats). If the quantity of oats is so less, where does the “fiber” come from? The key ingredient to note here is “polydextrose”. It is an artificial way to increase fiber intake. Do we need to start off our mornings with such synthetic fibre additives, when a bowl of fruits or a veg salad can give natural fiber, vitamins, minerals and wholesome nourishment to our bodies? The packaging itself states, “Polydextrose may have laxative effects”. Some of the side effects of polydextrose include intestinal gas (flatulence), bloating, stomach cramps, and diarrhea. One might argue that these side effects are applicable only when consumed in large quantities. My point is not about the quantity of intake but rather questioning the need for such artificial fiber. Here’s a good read on artificial fibre in the form of polydextrose that’s been added to foods to disguise junk as “health foods”. Now, let’s come to the 3 stabilizers listed in this pack. It is a term for refined wood pulp. Commercially prepared from wood and cotton. Please note that the majority of cotton production in the world is GMO. As per this site, this additive is approved in US but not permitted in EU, Australia and New Zealand. I have only scratched the surface when it comes to the side-effects of these additives. But the reasons are more than sufficient for me to never touch this pack. If I want to have a grain-dairy beverage, I would drink a glass of sathu-maavu kanji (health-mix drink) or sprouted ragi porridge. For fibre, my fruits, vegetables and millets are doing a wonderful job, thank you very much. No polydextrose and synthetic fibre for me, even if was co-created by Sachin himself. Which paper terra pack drink would you recommend which is healthy? Which tetra pack health drink would you recommend? @Anushka, if the tetra pack drink has no sugar (or very low sugar) and no artificial additives/preservatives, then I might buy it occasionally. Not sure if there is any in the market that fits the criteria.